August | 2014 | 8766 Days and Counting! 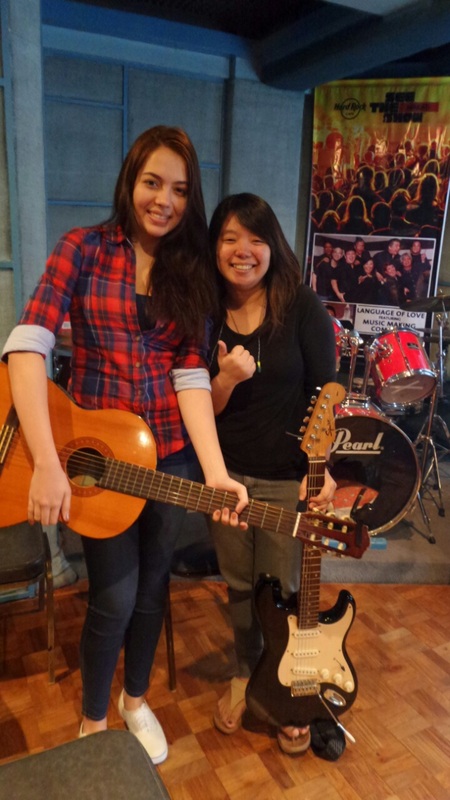 Believe it or not, I taught Julia Montes (19 year old actress here in the Philippines) how to play the guitar. She is required to learn for her upcoming movie. Since it was new for me, I prepared for our lesson more than the usual. Dressed up nicer, an hour early and even bought my english with me. But it seems that I never needed any of it. She’s just a kid. I don’t know how I concluded that one but she’s fun, she’s just talkative as me, with a good humor and simple. It was just like an ordinary lesson. What struck me most is that how she was enjoying herself with that simple lesson while having a gazilion responsibilities… well in fact, more than I do (I think). During our lesson, they (production team and herself) tell me about the storyline of the movie, what the director wants her to portray, how the director wants her to portray it, meetings and so much more. In between those are our breaks where she just talked about fun stuff like how she enjoyed studying baking lessons with Kathryn Bernardo recently emphasizing on the list of what they baked that day and how good the cakes were. When I got home, she and I exchanged pictures from viber. I posted 2 of our pictures on instagram, shared it on twitter and facebook. I never got that so many likes, favorites and retweets. Damn. I didn’t use much hashtags either. My phone was buzzing nonstop and almost got irritated. But this kid having almost 3 million followers on twitter, 500 thousand followers on instagram and hundreds of fake accounts… I wonder how she lives her life privately? How does she handle it? If it was me, I may never want that side of the job. Let’s face it. We always wanted attention but that much? It was just too much. And that was just 2 instagram posts. Imagine if she was the one posting it. Maybe 20 times the attention I got? She’s just a kid with a bunch of responsibilities and too much attention. How do you become a kid and cover it because you need to? I don’t know if you understand what I’m saying. lol. I don’t appreciate movie actors and actresses before. I do watch pinoy movies but not all the time. I’m not a fan girl, I don’t care about their personal lives and gossips like other people do. I think Julia made me appreciate them. It was nice that I met her. I think I never felt so sure in what I wanted until now. Why should I be chosen to be part of the 5th ELEMENTS MUSIC CAMP 2014? 1. If they ask me this question, I might just answer BECAUSE I REALLY WANT TO. I NEED TO. Music is basically my life and I can’t imagine having another outlet. Music somehow keeps me sane. 2. The instructors are my inspiration. I look up to them. I am motivated and inspired whenever I watch them play or sing at their gigs. And even just listening to their songs. I appreciate every ounce of it. I am moved by it. Sometimes songs give me chills.. I even cry and I can’t tell how it happens. Lyrics are goot but the music, it strikes me through the heart and stays in me like a drug. I like how it feels and I want to let it out through my own music. It gives me passion to my craft. They inspire me and I would really loved it if I become one of many others’ inspiration too. It’s like changing the world… scratch that! It’s like saving the world .. exagge much? Well at least makes the world somewhat a better and lighter place to live in. 3. I’m not that good. I know I have something and I want to be better. There’s this chaos in my heart fighting with my head and I want to let it out through music. I can’t make everyone appreciate what I write. In fact, I don’t care what they think. I want to express myself. I want to make music and I want to be good enough to give justice to my thoughts. I want to produce music. I am in love with it and I can’t just let it slip away without trying hard enough. I know it’s a bit silly but this is what I want. I believe in myself and I want to make myself better by learning a whole lot more — seeing through others’ perspectives, beliefs and passion. 4. I am a music instructor but who teaches me? I teach mostly kids violin, guitar, ukulele and high school bands. I love what I do and I love how they look up to me as their teacher. But I feel like I am limited. I think I stopped learning when I focused in teaching. I can’t study for now because of lack of funds. My band and I broke up. No gigs. I have limited sources to grow. I want to be better. I want to be better for myself and for my students. I don’t wanna ever stop learning and this right here is an opportunity to learn from the masters and it is for free. Wow. I never realized I wanted this thing bad. I’ve never been so sure of something for a very long time. Please pray for me to pass the auditions. I’m Falling In Love On How People Fall In Love… With Music. It’s so indulging. I am in a sort of magnet that draws me closer to those people. I find it inspiring how they fall in love with something and finds a way to live with it every single day. I’m a late bloomer. I learned a lot of instruments when I was young but never had I learned of music I wanted to play and listen to. It was always my dad saying PLAY THIS. PLAY THAT. THIS IS GOOD. THAT SONG IS BETTER. I believed him. I don’t blame him. It was my choice. But then it was when I stopped studying (Conservatory) that I started being exposed to music that I really wanted to listen to. I search for bands, artists to artists, songs after songs and it was endless pattern. I liked it. No, loved it. I like watching live performances, going to gigs, singing along with the crowd, staring and figuring out bass lines, getting into falling for ad libs and drum beats. Every performance is different from another, may it be frome a single artist or different bands. I like seeing through them that they love what they do and they are happy about it. Those people getting along just for the love of music… no pressure! I’ve met a few of them and believe me when I say, they are effin awesome and surprisingly humble. Most don’t care about popularity which is only limited to wanting people to connect with their music. Some would go to gigs without talent fee because they just want to play/sing. Some would practice so late at night even after dragging pressure at work just so they could make music. They don’t care who’s who, which band is better, or that guitarist studied at the conservatory — equal. I falling in love with the idea. And I know for a fact that I am making compositions just so that I can write one but to spread it to the world. In time, I’ll find that place where I get to be on stage again and not just be one with the crowd. Here’s a video of my band playing one of our original songs (I’m the vocalist; wrote the lyrics and melody). It’s just a bit sad that finding bandmantes is like finding the love of your lifr. You just have to put a lot of things into consideration… and it’s a commitment. BUT EVERYTHING, I PROMISE, SOON.